How Can You Choose What to Restore from iPhone Backup? Believe it or not, with the right tools, you can choose what to restore from your iPhone backup, instead of just restoring it all. How are you able to choose what to restore, though? What are the steps, and can you use Apple's usual software? The answer to the last question is...not really. You can restore an entire backup using Apple's software by clicking here to restore your iPhone from a backup. However, you will only be able to restore the whole backup and you won't be able to choose what you're restoring. Thankfully, there is a good solution to this problem. It can do what iTunes and iCloud can't: back up and restore partial data on iPhone/iPad/iPod touch. You can back up only WhatsApp on iPhone, or restore only messages from backup to iPhone. You can preview your data before restoring it, so that you confirm whether the data you are going to restore is what you need. 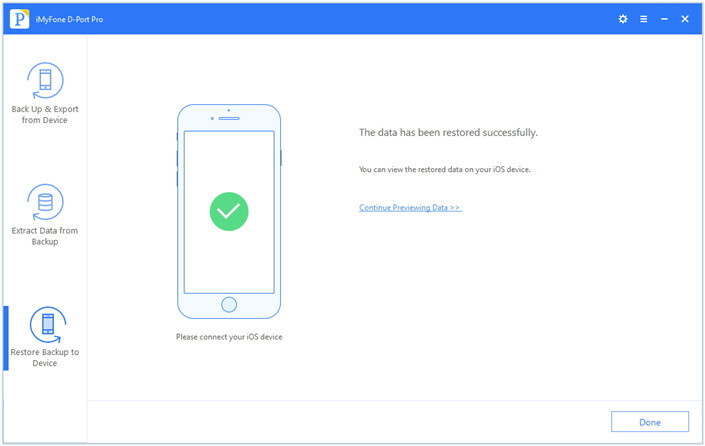 You can look at the data on your iTunes or iCloud backups without having to restore them on an iOS device. 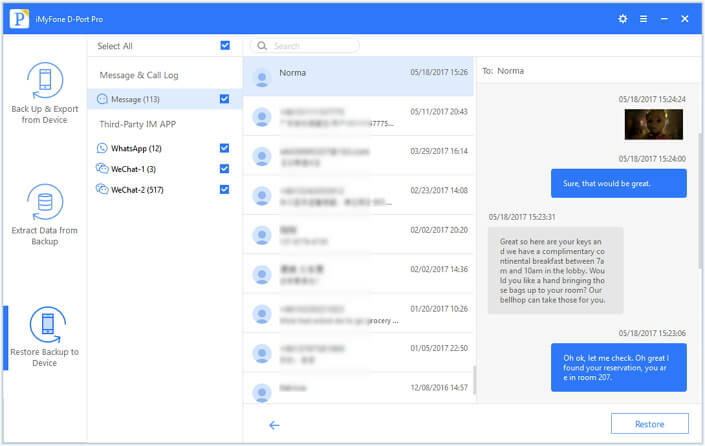 It is modern software that works with the iPhone 8 and the iPhone X, and is compatible with iOS 11. (1) First, you need iMyFone D-Port Pro. 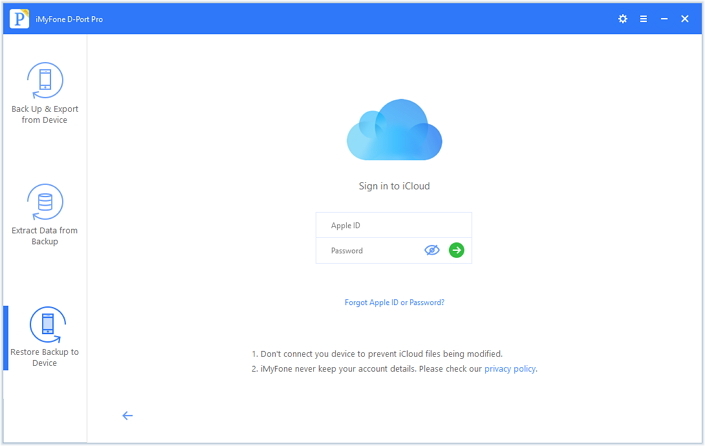 You can download this from the iMyFone official website and install it on your computer. (2) Open D-Port Pro and click where it says Restore Backup to Device. You will then be presented with a list of backups, including iTunes backups. Choose the backup you want and click Next. (3) Choose the data type that you want to restore, then click Next to scan the data in the iTunes backup. 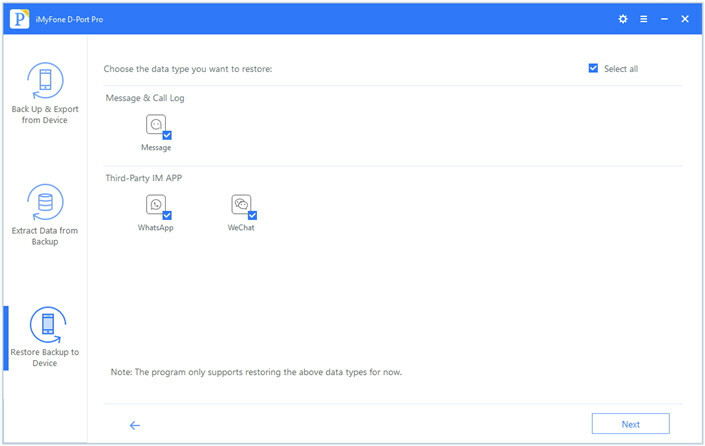 (4) Now you can preview the specific data that you want to restore from the list of available data. After that, click Restore. (5) Wait for the data to finish restoring. 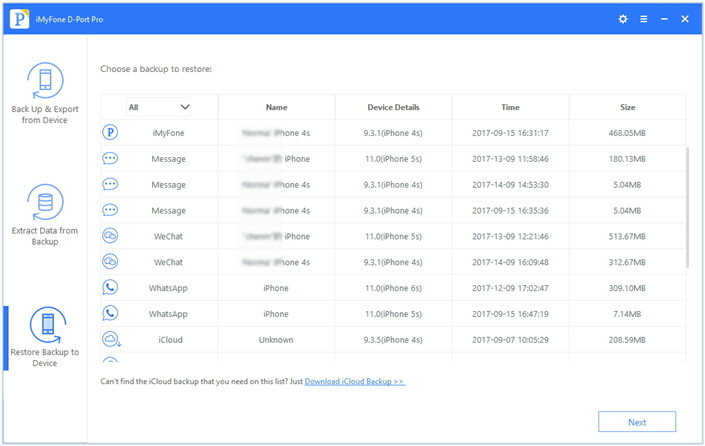 You can selectively restore data from an iCloud backup in a very similar way. However, first—after you've clicked where it says Restore Backup to Device—you have to click on a link to download your iCloud backups. You will have to put in your Apple ID and password. After that, the steps are much the same as restore from an iTunes backup, though. If you need to restore specific data from your iTunes or iCloud backup, it's certainly possible! It may not be doable with Apple's native software, but with iMyFone D-Port Pro, it's easy to back up and extract data in any way that you want. It gives you a lot more control and is definitely worth downloading for evaluation.